12/12/99 Sunday Evening We are UP 248% this year and UP $7,845 this month! It is time again to say goodbye to some Free Trial Toadsters because they will drop off the list this weekend - so they will be "Toadless" if they don't subscribe. See the rest of you here by the pond in the morning. That's it for this week, not a bad week. We traded three times for an increase of $6,420.00 - cool. Have a great weekend. Strange day, mixed signals and it felt like a lot of "Toad Traps" today. So, we are FLAT going into a weekend - geez that sounds nice doesn't it? Just said to Mrs. Toad that this would have been a great day to take her to lunch. Sort of b o r i n g so far today. Well, tomorrow is Friday and time for BAGELS! See you in the morning over coffee and bagels. We hopped out of 20 contracts of the Dec 760 puts OEZXL at 12. Just hopped into 20 contracts of the Dec 760 puts OEZXL at 9 3/4. Yep, I wanted those puts back right after we sold them... they hit a high of 12 1/2 today - urp... SCW, well we did make some green, so we can't complain. BUT, some Toadsters told us they hopped out a lot higher than we did! Doesn't bother me, bother me, bother me... See you in the morning. We just hopped out of the Dec 760 puts OEZXL at 10 3/8. We watched them hit $11 TWICE and we had our sell set at 12 and then at 11 1/2. Oops. Just hopped into 20 contracts of the Dec 760 puts OEZXL at 10. GLOBEX finished down 4.2, let's see what the market does today. We SCW hopped out at 10 1/2 today - but we thought they were gonna hit $11! When the market started heading back up - we saw some signals changing and started changing our sell point to hop out. A couple of minutes after we got out that sucker hit $10 - URP. That's it for today. We considered puts again between 2 and 3 after the market had gone back up to 762 and was headed down again. We just didn't like some of the signals during that time - so we stayed out. The 760 puts that we traded are back down to $9. Heard from some of you who hopped in after the Toad at 9 and hopped out at more than the Toad..... hmmmm.... See you in the morning. Just hopped out of the Dec 760 puts OEZXL at 9 3/4. Mrs. Toad mentioned earlier that maybe we can only get 1 1/2 out of this one... that was when it was stalled around 10 1/2. Hmmmm.... Well, we are FLAT and looking. Also, Toad Talk© was updated last night. Go listen. We just hopped into 20 contracts of the Dec 760 puts OEZXL at 9. Crisp winter night here in Florida - it might go as low as 45 degrees! Guess that's it for tonight, see you in the am - right here by the pond. Have said the same thing to four or five Toadsters - so let's get it out to everyone. We didn't hop into the ever popular PUTS today because we were in a trading range between 764.50 and 768 ALL DAY and it didn't break out until right before 3:00. That's a dangerous time for a Toad to hop, as it's right before we see the bond guys starting to mess with the market. On many day's we see a DRASTIC change in direction around 3:10 or so. So.... that's why we are still FLAT. Trading range... trading range... trading range... Really tired of hearing that on CNBC, tired of seeing it in the market also! So, we are still dry, sitting by the pond. 12/5/99 Sunday We are UP 218 % this year! It is time again to say goodbye to some Free Trial Toadsters who will drop off the list this weekend - and they will be "Toadless" if they don't subscribe. See the rest of you here by the pond Monday morning. So, FLAT TOADS are we! Have a great weekend and we will see you by the pond on Monday morning - now it's back to the Christmas lights! Hopped out of 10 contracts of the Dec 770 puts at $11 1/2 and we are FLAT! Just hopped into 10 contracts of the Dec 770 puts OEZXN at 10. Serious trading range after the morning pop, most calls are back around their possible entry points at 10:45 to 11:00. Now with the president speaking the signals are going down... Hmmmm... stay close to your radio, er computer... this is getting interesting. Loved the Payroll Report - futures up 18 points. Loved the game last night! Figured I'd better start getting the Christmas lights hung. Non-farm Payroll report comes out in the morning and we will be here. We had a great time at the game - did you look for us on TV? See you for bagels in the morning. Not a good one today. Hoped to see something right before three o'clock, but it was just a TRAP not a breakout. Well, it's Jaguars tonight and Bagels tomorrow - is this a great country or what? See you all by the pond in the morning. Go Jags! Sending this one out just to keep y'all AWAKE! B O R I N G day by the pond, should have finished the Christmas decorations today because we won't be here tonight - we will be at the JAGUARS game! Try to stay awake, and I'm watching the pond - and watching - and watching... Yawn. Still by the pond - watching. Today was filled with opportunities to get in on the WRONG side. Since our last update, there were three good chances to mess up. We were looking closely at puts twice and calls once today - glad to be FLAT! See you in the morning. Not sure about this market and no one else is either. Even CNBC says there are mixed signals. Last night we put information about this on the site: Standard & Poor's said it will add Yahoo! (YHOO:Nasdaq) to the S&P 500 index and Canadian school bus company Laidlaw (LDW:NYSE) will be removed. We are by the pond, watching. Look at the charts from today... (toaday) ... strange signals. Profit taking late in the day - seems we have seen this before. Not going to jump on the bandwagon, er, hop off the lily pad. Mixed signals so far today, keeps toads out of the pond. Good morning, let's see what the last day of November brings. Only one more month in this millennium - depending on your definitions! Oooooooo! Today's high on the Dec 750 puts OEZXJ was 14 7/8 and they kept on hitting 14 1/4 after we hopped out - never did hit 15! Our original sell was at 15 1/4! Urp. We are UP $9,410 this month! Cool. See you in the morning. Hopped out of the Dec 750 puts OEZXJ at 14 1/4. Was concerned when the TICK started back up, might be an early hop out - but we can live with that. Just hopped into 20 contracts of the Dec 750 puts OEZXJ at $13 1/4. Might ride this one for a small one and then hop out. Will let you know when we hop. We are UP over 200 % this year! It's time again to say goodbye to some Free Trial Toadsters who will drop off our list this weekend - they will be "Toadless" if they don't subscribe. See the rest of you here at the pond in the morning. Hope everyone had a great weekend, Jaguars are playing here again on Thursday night. Watch for us at the game. Nice weekend so far, Mrs. Toad and I spent some time with Little Toad over the weekend. Nice family get together around the pond. Hope your weekend is going great. 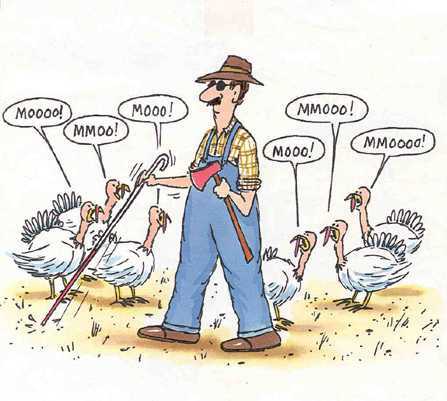 You all have a Happy Thanksgiving. That's it for today, Happy Thanksgiving. Received this from a Toadster - take a look. Click here Click on your back arrow to return to this page. The charts look strange - could be because so many are taking off early today. The bonds close at 1:00 but we are still open. Beautiful day here at the pond, it's going to be a beautiful Thanksgiving around the pond. Little Toad is coming home for Thanksgiving! Still watching the pond, stay tuned..
Also wanted to remind everyone that we will be OFF on Thanksgiving (11/25) and Friday (11/26) - the market will be open until 1:00 on Friday, but we will NOT be around the pond. Yes, it was a quick one, we are out of the Nov 750 puts OEZXJ at $14 3/4. Whew, we are done for today. Just hopped into 10 contracts of the Dec 750 puts (OEZXJ) at $14. Will let you know when we hop out - it'll be for a small one. Didn't get the Dec 750 puts OEZXJ at $15 and looks like the market is going up again. Pulled the order and we will keep you posted. Good signals today - said STAY out! Drew said it best when he said it was "a huge bifurcation in the market" today... gonna go find out what that means and see if I can chart it! See you in the morning. Had a divergence that makes little green Toads uncomfortable - so we stayed out of the pond. Looked like the tick was reading about 500 low... maybe it needs to be calibrated? Looks like we are in for a strange week, the TICK is large negative number, the A/D says D's beating A's 2:1 AND .... the OEX is UP 3.06. Good morning, had a great out-of-town long weekend and got back in time to see the Jaguars beat the Saints! Let's see where the market takes us today. Jaguars 41 - New Orleans 23 Jaguars won! We are 9 and 1 ! No Free Trial Toadsters dropped off our list this weekend - extended them because we were OFF on OEF - see everyone here at the pond in the morning. We are off on Options Expiration Friday! Recommend you take off also, if you wonder why... Read this: Options Expiration Friday! Don't forget your Bagels tomorrow. See you on Monday morning. More up volume than down volume, decliners beating advancers, signals without direction. And it is Options Expiration Thursday. We're calling it a week. Have a great weekend. See you at the pond on Monday. If we would be looking for help with our soggy puts, we wouldn't be finding it today. And it doesn't look like the lunch bunch is going to do any better. We'll keep watching for awhile yet but will probably leave the pond early today. Mrs Toad is taking me away for a long weekend. Good morning, looks like we'll have a rally at open. We'll be by the pond, watching things. Today looked just like an Options Expiration Wednesday - opportunities to make a large mistake. Didn't hop today, see you in the morning. Interesting day... lots of volume on the NASDAQ, lots of ups and downs on the OEX, little bumps in the road, little waves on the pond. I wax poetic on days like this. See you by the pond tomorrow. Back by the pond - even managed to fit in a tasty lunch. We're keeping an eye on things. Going to be hopping away from the pond for a few minutes around 11:00 - have to take a car into the shop before we head out for our Options Expiration Friday long weekend. Should be gone from about 11:00 until 12:00 and will let you know when I get back. Remember, we are taking off on OEF and recommend you do the same. If you haven't listened to Toad Talk© yet this week, we have a "guest" - go listen at Toad Talk© OR go to ABS Live and listen to Toad Talk©. Before the Fed announcement today we had an order ready to purchase 20 contracts of the Nov 730 calls (OEYKF) at 11 1/2 - was waiting for the announcement (and subsequent reaction) to make the buy. The first reaction was UP two points and then it changed direction much like we saw on another Fed announcement recently. The market started screaming DOWN and we changed our order to Nov 730 puts (OEYWF) and we hopped in at $5. There was a "false" rally that appeared to be a Toad +10 as the puts went against us (as usual) - then the market started back down (as we expected) - er, and then... er, around 14:55, the unexpected happened - the market started UP. Don't know if this will back off again, but we are out. That was TWO head fakes or it was the same uncertainty we have seen all day. This is the first time in a long time that we haven't been able to ride the Fed decision for a solid profit. We are going to exit this position, will continue to monitor the market for a possible dip and then try to exit with a little green. We just hopped into 20 contracts of the Nov 730 puts OEZWF at 5. Will let you know when we hop out. Still waiting for the FED announcement. Traders are split on what is going to happen and that's no surprise. We will keep our eyes on the market and let you know what we do as soon as we hop. FOMC tomorrow... Interest rate increase? Toad Talk© has been updated - go listen to a Toad! Click on Toad Talk© and listen... OR go to ABS Live and listen to Toad Talk©. Guess NO ONE wants to make any commitments until we hear from the FED's tomorrow. Well, that's all for today - see you in the morning for FED WATCH! We are back from the Doctor's appointment, and we are doing fine. Jaguars 6 - Ravens 3 Jaguars won! Had a good week - picked up $4,565 this week, $8,955 so far this month - not bad for a Toad. Our soggy puts from October are taking gas. Woulda been a GREAT week without those puts. How about a MAJOR down on Monday before the Feds meeting? - probably not. Everyone have a great weekend, Jaguars are back home again on Sunday. Watch for us at the game. Signals are still mixed and it is Friday. Sounds like the perfect combination for calling it a day, even a week. We sure don't want to get caught this late in the day. See you Monday by the pond. Just checked the TICK, have been watching what's going on. Mrs. Toad says we're making a V today. She has such a way with market analysis. The Bond people are back today and they loved the productivity figures. It's a beautiful day by the pond. Stay tuned. Thanks for the Veteran's Day wishes that a lot of you sent. Mrs. Toad says we should probably take off on future bank holidays as the trading is slim. We will have to think about that - we did make $1,125 today! Tomorrow is Friday and that means BAGELS! So, in the morning put the coffee on and let's have some bagels. Mine are the ones with the little black things in them... See you in the morning. We hopped out of our 10 contracts of the Nov 720 puts (OEZWD) at 8 1/2. Mrs. Toad said a buck plus a little was great. Just hopped into 10 contracts of the Nov 720 puts (OEZWD) at 7 1/4. Don't know if it's because this is a holiday for some, but this is a funny market today. To prepare us for Veteran's Day tomorrow - take a look at this site: Timeline of Momentous Events in U.S. Military History Interesting. Well, that was an interesting day - look at the charts from today and you will see that we went down on open, then up until 1:15, then down until 3:15 and closed out with a spurt to the up side. Whew! We are tired from just watching... all for a 3 point gain in the OEX. Don't forget to thank a Veteran tomorrow. er, The Toad is a veteran... no, don't send gifts. That was just an end of lunch sucker play OR we are getting ready to regroup and head higher. Didn't bite when the market started up because we still don't have confirmation that this is a "wave" - maybe it's still just a ripple on the pond. Thought we might be able to hop on something this morning, but nothing yet. When we get close, the signals don't confirm. So the market is not sustaining any of this ... yet. Stay tuned, we are here by the pond, watching. Was just looking at some of today's charts - nice signal. SCW stayed in til it hit 11 5/8, but Toads rarely get in at the low of the day and rarely get out at the high of the day - I can live with that. See you in the morning. We continued to watch the market for another move worthy of hopping into and it never showed up. Looked seriously at the 710 puts (OEZWB) and had the signals been there, we would have been in around noon at 6 3/4 to 7. We never got confirmation to hop and glad we didn't. So, unless the market does some SERIOUS tanking and we get out of the soggy puts, that's going to be it for the day. Not a bad day's work - we are UP $3,390 today! "How much are your WJ's going for now?" She sure knows how to hurt a Toad. Just hopped out of 20 contracts of the Nov 720 puts (OEZWD) at 10. We just hopped into 20 contracts of the Nov 720 puts (OEZWD) at 8 1/4. Not a day we wanted to ride. Sat and watched the pond - that's best on a day like today. Lot of chances to stumble when the signals are so mixed. Microsoft regained 50 billion dollars in shareholder value today - WOW. Think they will soon have enough money to buy the US of A? This has been a choppy day, keep hitting my monitor to see if maybe something is reporting wrong... Looks like a sawtooth today. So, flat we are (except for the #^%^*^$#% Puts we are holding) - with the down movement this morning, was thinking OK for the puts.... then, nothing. Geez. We are still watching the pond. Updated Toad Talk© - go listen to a Toad! Click on Toad Talk© and listen... OR go to ABS Live and listen to Toad Talk©. 11/7/99 Sunday We are UP OVER 200% this year! Some Free Trial Toadsters will drop off the Free Trial list this weekend - and they will be "Toadless" if they don't subscribe. See the rest of you by the pond in the morning. Enjoyed the festivities with Little Toad this weekend and the Jaguars won! We are now 6 and 1. The first Microsoft ruling is coming out tonight. This reminds me somewhat of the breakup of AT&T. Best way I know to breakup Microsoft is to have some other company "build a better mousetrap." Have a great weekend, see you Monday morning. Have a great weekend - homecoming this weekend in Gainesville and we are headed down there to visit Little Toad and take in some of the festivities. See you at the pond - Monday morning. Just one more hour of trading this week, unless we get some strong movement we are not going to hop today. Been in a tight trading range since about 10:15 and haven't been able to break out. Which way it will break is the question.... or the question "Should we have another bagel while we are watching the pond?" Here debating with myself about the bagels or lunch, hey it's Friday, let's do both! It's YOUR TURN to bring the bagels! Well, our signals kept us out of the market or we would have been proud owners of the Nov 720 puts (OEZWD)at 15. (They are all of the way up to $14 now!) From the charts it looks like they touched 16 once but we probably would have had our sell at $17! Never saw the D's beat the A's today... but it was dropping most of the day. EXCEPT for when we were gonna hop into the puts... did we cause that - again? I have had this request from several Toadsters and Mrs. Toad thinks we are SICK. If you want this sound, send us an email and we'll forward the file to you. For those of you who would rather hear the Weis of Bud Weis Er fame (the sound I use), just send us an email requesting that instead. YES!... er, that's why we didn't hop into puts around 11:40, I wanted to argue with the signals, thought we should consider puts and then.... the market shot back up. So we are sitting by the side of the pond, watching the market & waiting for signals! Good morning, jobs report won't hurt this market, headed UP this morning! Congrats to closed above 3,000 today - first time ever. Course that didn't help us to hop today as the signals were mixed. SO, see you in the morning. Nope, not gonna fall for any of those sucker plays today. Our signals kept us out of this and glad they did. I'm back at the pond, watching. Mrs. Toad and I are doing fine. This was just a reminder that we have Dr.'s appointments this morning, so we will be late to the pond. Should be back around noon. Will send out an update as soon as we return. Er, that put hit a high of $19 today! Ribbit! We have Dr.'s appointments in the a.m., so we will be late to the pond tomorrow. Actually we will be here until right before the market opens and then we should be back around noon. Will send out an update as soon as we return. Yep, this is still related to our auto accident of last year. See you in the morning. .....she knew I was already out. Glad it worked out, see you in the morning. Just hopped out of 20 contracts of the Nov 720 puts (OEZWD) at 15 3/4. Whew! That was FUN! Glad we got more than $15 because Mrs. Toad said, "You should just go for 1 1/2 - the last time you went for 2, you wound up holding over." We just hopped into 20 contracts of the Nov 720 puts (OEZWD) at 13 1/2. Market shot up til a little after 11 and we considered the 715 and 720 calls which have not moved up from our entry point. Since the market peaked, it's been headed down with the rest of the signals. Oops, you can get them cheaper now. Still haven't hopped yet today. Looked like profit taking today as the market went sideways until a little after 2:00. Didn't get the signals to hop today - probably good we stayed out. Two or three or four or five more days like today and maybe our puts will be worth something! That was close, had our little toad foot on the mouse ready to hop into some more puts, but don't have all the signals yet. Stay tuned. Also, we updated Toad Talk - check it out on the site or at ABS live. p.s. Send us your Yahoo name to be added to the Yahoo Messenger list! Watching the market go sideways in it's trading range so far today. Haven't had the momentum yet. Still watching. If you haven't read about The Legend of the Toad, it's on the website. Posted it on 10/31.